Did I cover the first three seasons? That would be a negative. But that won’t stop me from covering this one now that I have officially completed the third season which aired in 2012. The premise of the first season was one that caught my attention right away, but when no English subtitles were found for a long time, I gave up the drama and came back when not just the first, but second and third seasons were subbed as well. And here we have the fourth season. OCN is good at delivering dramas with multiple seasons spread over the course of several years. So the seasons are not consecutive non-stop like most serialized American television. If you’re new to God’s Quiz, it’s about the brilliant Han Jin Woo who quits his job as a surgeon and takes up a position as a medical examiner leading a team of experts. They handle cases involving people with rare diseases. Formulaic? Perhaps, but there’s just something about Ryu Duk Hwan and team’s portrayals of their characters and there is always a greater mystery running underneath the individual cases that brings everything together and I really do like it. A lot. Season 4 picks up one year after the ending of season 3 which left us with Han Jin Woo [Ryu Duk Hwan] collapsing on his way to meet his lady detective girlfriend Kang Kyung Hee [Yoon Joo Hee] who had finally returned from the US. We open with Kyung Hee and team chasing down kidnapper suspect Kang Bok Ju. The man escapes and Kyung Hee manages to corner him and the two scuffle. She shoots him in the arm and he brains her with a brick. The detective in charge of the investigation takes care of her while the men chase after the runaway. Throughout this entire episode I could not catch that man’s name for the life of me, but looks like he’ll be a regular in their investigations. Anywho, she returns to the ME office and refuses any treatment at all until she changes and sees a sketch artist to describe the suspect upsetting Chief Jo [Park Jun Myun]. We then finally learn what happened to Jin Woo. He’s currently in a coma right now. We cut back to him fainting, receiving brain surgery and being like this for an entire year. His consciousness is awake. It’s slow and sluggish and moving slow, but it’s active. Hurry up, Jin Woo-ssi! Wake up and solve the case and get reunited with Kyung Hee at last! 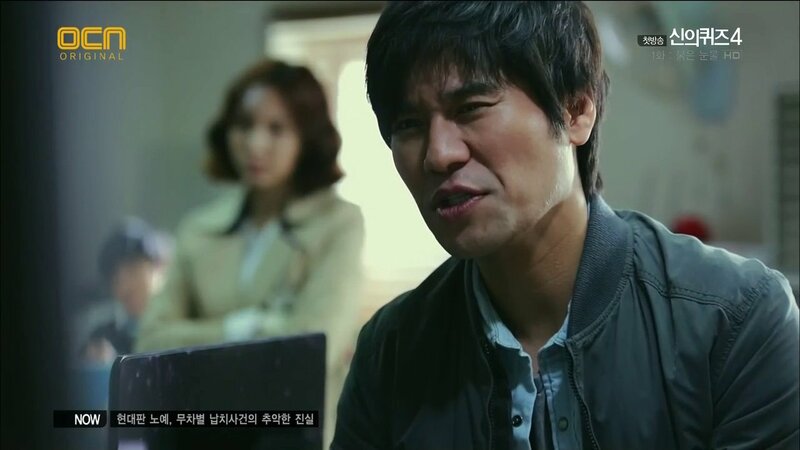 Back at the station Detective Fart Face [what Jin Woo names him once he wakes up], is angrily writing up a report about how the kidnapper of the disabled people got away. Kyung Hee brings in her composite sketch of the accomplice and the whole team is baffled about how the lone wolf who never shows his identity had an accomplice who didn’t care if his face was shown or not. Unfortunately, the detectives are no closer to finding this man who kidnaps mentally handicapped and disabled people and sells them to sweatshops, brothels, and factories. What a scumbag! Kyung Hee goes to the hospital after work and with a smile on her face, she cleans up Jin Woo and cutes his nails. Chief Jo comes in and whines for the jerk to wake up already. It’s hard on he and it’s also really hard on Kyung Hee. She leaves the hospital and goes home. Who has a swing in the middle of their house? That’s really cool and highly dangerous given the right person. I’d like a swing in the middle of my room…maybe. She takes out a beer, sits on her indoor swing and imagines Ji Woo with her trying to comfort her. She sadly says that it’s too hard. At this time, Jin Woo’s eyes flicker. It’s like their hearts…er…brains are connected! The investigation team splits up to talk to the factory owners who bought the disabled people and the rescued trio. Of course, none of them are very helpful. Of course the factory owners will hem and haw and deny responsibility for their actions while our disabled people are too confused to understand the questions they are being asked. One man with a discolored and twisted face says he overheard the kidnapper talking about running away and going overseas at the end of the month. Oh no! Time is running out. Will the team solve this case in time? Meanwhile Jin Woo sees his other half slowly fade away and he freaks out. 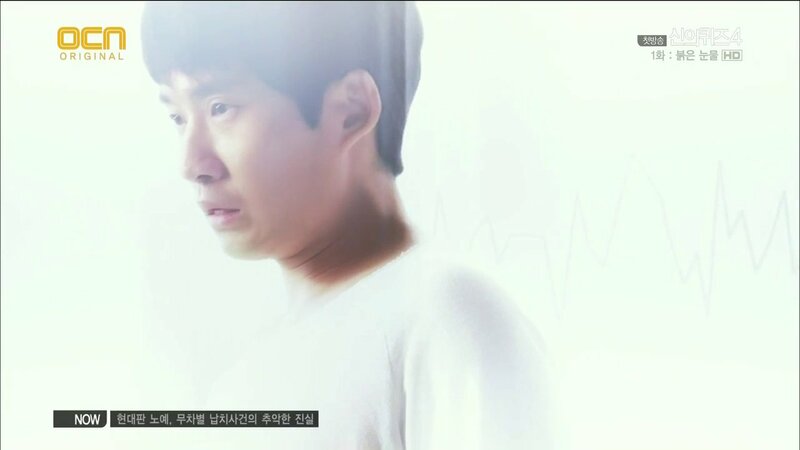 Enter his mentor Dr. Jang [Choi Jung Woo] who died at the end of the last season to save our team. Jin Woo complains he’s tired and doesn’t know what to do or how to go on. Dr. Jang warns that if Jin Woo doesn’t shape up, he will cease to exist just like his other half. He then complains that Jin Woo never knew how to understand important memories. Dr. Jang then tells his student to close his eyes and go forward. Jin Woo does close his eyes and is flooded by memories from our first three seasons. He starts walking and comes to a door in his white world. He slowly takes the handle and opens it and bravely walks through. Jin Woo…wakes up!!! Yeah, he’s only out of commission for 15 minutes. Yeah. It’s only been 15 minutes by this time. Hee. Kyung Hee races to the hospital at full speed. Chief Jo is already in the room and explains that Jin Woo is just staring into space and not saying anything. Kyung Hee doesn’t care as he’s awake at long last. Jin Woo then looks at her and weakly asks who she is. This freaks Dr. Jo out and Kyung Hee isn’t happy that Jin Woo can’t seem to remember her, but again, it’s okay as Jin Woo is finally awake. Jin Woo, being the mischievous little devil that he is, can’t hold it in any longer and he starts laughing complaining that the two are still as gullible as ever. This does anger the two, and Chief Jo wonders if his year in a coma has made him even weirder. Jin Woo then rattles off the things he remembers hearing, like Chief Jo going on a diet, and then he really notices Kyung Hee’s wounds. Who hurt the beautiful lady? Before Kyung Hee can do much, she’s called back out for the case leaving Jin Woo all curious and he hates being curious. It turns out that the investigation team has discovered the accomplice. They almost lose him again, but Kyung Hee gets there and points her gun point blank in his face. Try running. Just trit it. They get back to the station and get a huge surprise when they learn the supposed accomplice is really the father of one of the victims. Fart Face and Kyung Hee go in to question him and since he’s an expert Ham radio operator, that is how he got the kidnapper’s location and acted on his own. He was going to get the man to reveal his daughter’s whereabouts and then kill him which earns him some obvious grief from our officers. The main complains about how his daughter is sick and needs him and how he gave the cops a year with nothing to show for it. What a great way to show contrition for getting rid of the only lead the cops had to nab Mr. Baddie. While that is going on, Jin Woo is getting some fresh air out in a wheelchair. At least they don’t have him miraculously able to move without any issues. Even with therapy for coma patients, their muscles still weaken. Anywho, he’s taking it all in when he breaks down and sobs. A little girl comes up and asks why he is crying. Jin Woo says he isn’t and the girl asks if he’s the patient who just woke up. Jin Woo says he is and the little girl says that she can’t cry in front of her parents necessarily either. She leaves after giving Jin Woo a hanky and he smiles as he looks at the hanky. After the interrogation is over, Kyung Hee goes to the hospital to visit Jin Woo. She asks what he’s doing sitting up when she should be lying back and resting. Jin Woo says he is looking at the scans and surgery information and he’s pleased. Everything has finally gone back to normal. He then tells Kyung Hee she no longer has to worry about him. Kyung Hee then tells him she wants him to retire from the ME team as who knows what can happen to him. This surprises Jin Woo. Kyung Hee then reminds him of Dr. Jang’s untimely death. She has seen what has happened to Jin Woo over the course of the years and doesn’t want him put in harm’s way any more. So funny. Normally this is a speech guys give girls and not the opposite way around. Jin Woo’s reply is, of course, that he cannot quit. Of course not. We then get some OTP snuggle time. These two are always so cute together! Ah. Jin Woo asks who performed the surgery. Kyung Hee refuses to talk about it and this is the big secret for this episode. Previews for the second episode show Jin Woo finding out and NOT being happy. Is it the psychopath from season 3 who was not as endearing as the psycho from seasons one and two? Psycho from season 3 was Go Kyung Pyo as Seo In Gak. I just was not as in love with this evil character…um…that sounds wrong doesn’t it? I mean, even though Ahn Yong Joon’s Jung Ha Yoon was very evil and did many bad things…he was endearing in some way. In Gak aka the fake Dr. Phantom was just…meh. We get a brief scene of the kidnapper returning to his layer and feeding the victims. He puts money in the safe and snuggles down to sleep. Since he’s not abusing them and giving them food and letting them watch TV, the kidnappees aren’t thinking to overpower and run away. The next day Jin Woo is complaining about how he wants real food, but thanks to the fact he’s been IV fed for a long time, normal food is not recommended. He then meets the new addition who is replacing Seong Do [Na Yoon]. How sad! A familiar face from the first three seasons is not returning. I did love the original team very much and it’s sad he’s gong. Replacing him is idol turned actress Kim Jae Kyung playing Im Tae Kyung. Get this…she’s a formal idol who has become an ME. Seriously? Aigoo. Anywho…not really enamored with the idols joining this cast for some reason. Probably because I’ve become too attached to the other teams from previous seasons. Jin Woo is getting more and more curious about the case and Kyung Hee finally breaks down. Jin Woo can get around with a cane now and he goes back to ME HQ. Kyung Hee apprises him of all the information they have so far and then talks about Jung Mi and her father (the one who tried to be a vigilante). It turns out that Jung Mi has a rare disease that no one knows the cause of and no one can treat in which she cries tears of blood. After being ruled a freak and constantly looked down upon, Jung Mi vowed to never cry again so that her father won’t cry in return. Such a heartbreaking flashback and such a sad promise. We do cut to see that thankfully Jung Mi is not yet dead, but she’s not doing too good in her factory work. Jung Mi is not the only kidnapped disabled person with a rare disease. Two of the three that had been rescued already have rare diseases as well. Jin Woo looks at their info and believes that these two will old the key to the kidnapper’s whereabouts. The next day the team learns of a body being discovered. It appears to be another one of the kidnapped disabled. 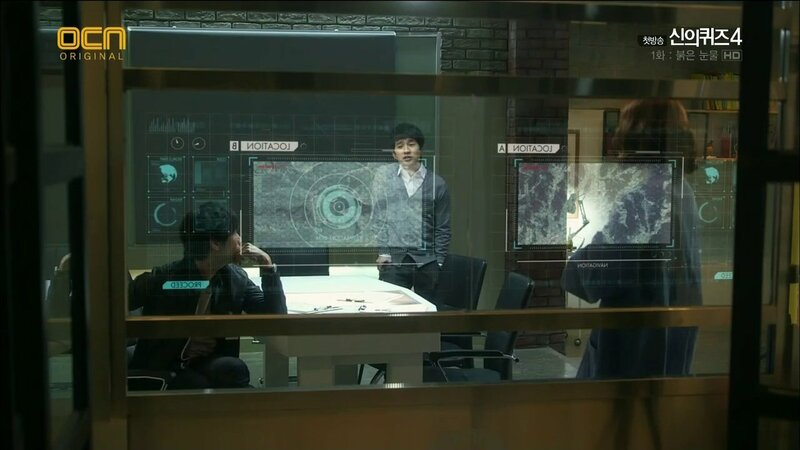 An autopsy is performed and Jin Woo is able to view it via remote. The team is horrified to learn this woman was buried alive. She fought hard to break out and is covered in scratches and bruises while her lungs and stomach are full of dirt. Poor girl. This is where Jin Woo proposes on meeting the recovered victims. So Kyung Hee takes him out of the hospital to meet Detective Fart Face and he and Jin Woo don’t hit if off well at all. Before we get to that scene, though, we get Kyung Hee and Jin Woo eating kimbap. Kyung Hee is worried about him eating such food so soon after waking up and Jin Woo waves it off as it can only give him a bad case of diarhea. This annoys Kyung Hee since they are eating. But since Jin Woo is thinking about bodily fluids, he wonders who took care of his poop and pee. Kyung Hee says that poop wasn’t an issue with him being fed intravenously. Jin Woo knows this, but before his body was completely emptied of solid foods, there would be. Kyung Hee admits she took care of all that for him. This mortifies Jin Woo. She saw his…thingy…didn’t she? LOL what a cute scene. Poor, Jin Woo. Kyung Hee and Jin Woo arrive at the station where Fart Face is upset that they are questioning the victims again seeing how it wasn’t helpful. Jin Woo rolls down his window, surprising Fart Face. He explains that a different person questioning could bring different results. Yeah, these two not the best of buddies to begin with, but usually the people who annoy Jin Woo the most become good friends with him in the end. Anwyho, Jin Woo begins his questioning and while it does seem a bit like it’s going in circles, he is able to glean new information from the two about where they were kept, etc. So it was not a lost cause. After all of that, Jin Woo visits Jung Mi’s father in jail and asks why he made such a promise with his daughter. To stop her from being in pain. But not being able to cry is even more painful, isn’t it? Jin Woo and Kyung Hee make Jung Mi’s father promise that he will let her cry as much as she wants when she returns. Fingers crossed she returns safe and sound, right? That night, both Jin Woo and Kyung Hee have brainstorms about just where the base is for the evil kidnapper. We then cut to see that poor Jung Mi has collapsed at her job and is taken back to the hideout. We know that he’s already disposed of people who were no longer useful by burying them alive, so we know Jung Mi is in grave danger! The next day Kyung Hee shares her discovery which narrows down the search area to 8 kilometers. This doesn’t impress Fart Face since that is still a wide area. Jin Woo narrows it down even more to a mere 1.3 kilometers. Since it’s a rural area, they only need to target shops in the area to find someone who buys lots of bread, etc. They find a match and learn from the storeowner where the masked man lives…or rather at least which direction he heads off in and the race is on. While the police are closing in, Jung Mi’s time is almost over. The kidnapper grabs the girl and a shovel and heads out just before they arrive. They secure the kidnappees who tell them what happened to Jung Mi and Kyung Hee and the rest go rushing up the mountain and manage to get to the bad man before he can bury the poor girl. He tries to run, but Fart Face stops him and boy are they in for a big shock when they see the mastermind’s face! So what was so shocking? It’s the twisted face man from earlier! His mental disability was all just a big show to throw suspicion off and to also throw the police off the trail with false information about the criminal going abroad. So why would he harm people like himself? He picked those weaker than he was as that is the only way it could work. He talks about how he was mistreated and abused all of his life. He had enough and he was really down and out. When he killed his last boss, he asked why his boss did what he did to him and the boss’s response was because the man was weak. Yeesh. Jin Woo gives him a stern lecture about how he failed as a human being and you know he’s right. For someone who was beaten, abused, used, etc., how could he force the same thing on others just as weak and powerless as he was? Tsk, tsk. After all is said and done, Kyung Hee bids her sunbae Fart Face adieu and hopes they never see each other again. Fart Face asserts he doesn’t believe he was wrong all those years ago and Kyung Hee says she won’t be expecting nor accepting any apologies from him. Ooooh, what mystery have we here? We then cut to a tearful reunion between father and daughter and Jin Woo comments that her red tears make the pain all the more real and visceral. Normal tears are easier to ignore the pain of others while red tears make that impossible. True. Our official end of episode is Kyung Hee delivering the good news that Jin Woo can be officially released the following day. This makes him happy, but again he’s brought back to the question about how operated on him and again Kyung Hee wishes to avoid answering this. When he learns the truth, he isn’t happy. Ah, such a good drama! Looking forward to maybe watching episode 2 tomorrow. G’night. You could technically start with season 4, but they do have some correlations and connections to past events and cases of the previous seasons. Like the beginning of this season takes place one year after the ending of season 3 and we finally learn what happened to Jin Woo at the end of the that season. You hear mention of characters who are no longer present..but then again, there aren’t too many of those as of now, so you could start this without having watched the previous seasons, although they are definitely worth watching. I love d them all.